RED SEVENS were on hand at MPOC 2 installing SEED RtR Upgrades - in these pictures Jane and Paul were installing the SEED into team Xtioneer Allan Phang's Rotor. Paul is replacing the motor with 1 of 2 optional new SEED motors that comes in the SEED kit. The Green motor is for more Speed and the Red motor is for more torque. What you will also get is a new smart board that will detect a mis feed or ball jam within milliseconds and work to clear it without you even knowing. You will never realise if there is a misfeed or a jam as the SEED will clear it as you play. 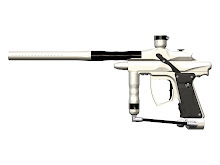 Opening up the Rotor during a game to clear a jam will be a thing of the past with the SEED planted in you Rotor. 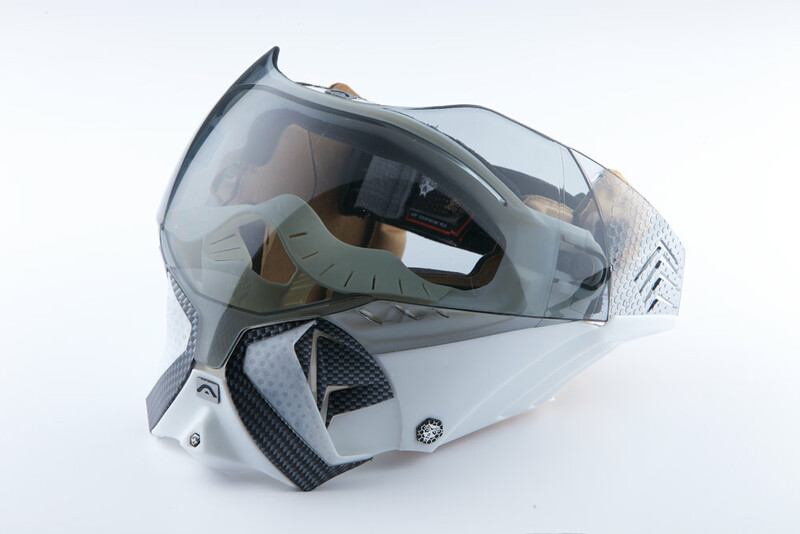 You will also get nifly new gear that will save battery power and enable the SEED motor to reverse and free ball jams. Jane is almost done with the installation which takes less than 15 minutes. You can see the green motor which is the speed motor has been installed. And other motor which is the torque option is red colour in the box. Welcome to the SEED family Allan Phang. 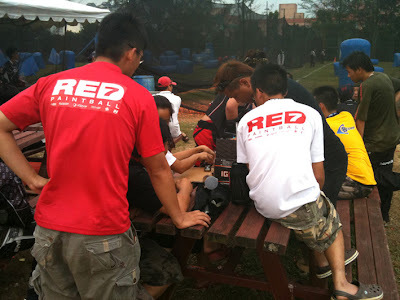 Last Sunday the RED SEVENS had a big turnout for the Basic Paintball Course. Over 25 guys and girls and even the Black Aces came along to Red Dynasty Paintball Arena. The turnout was bigger than we expected and we had to split everyone into 3 groups for the course. The Red Sevens were there running the new players through things like how to stand and play the bunkers, running and shooting to sliding and diving. I must say that it was good to see the Black Aces come out and support the event. And they also played in the skirmish games after the course. This is really good as it shows that they are really commited to learning the sport. 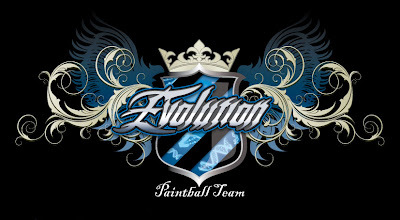 We hope this course will encourage more people of all walks to come out and try and get into paintball. The youngest player that came alone was John at the "legal" age of 14*. We also have a good response from the ladies who also came out. 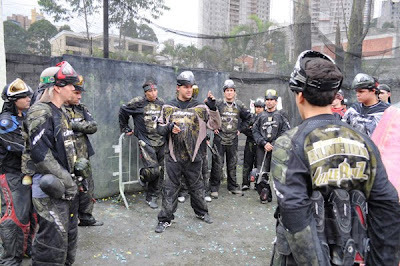 The Basic Paintball Course is free - and each participant will receive a certificate of participation which is issued at Paintballers World pro shop at Beach Road in Singapore. If you would like the RED SEVENS to teach you and your friends how to play speedball do write in to us info@redsevenspaintball.com or to me at seburo55@yahoo.com. 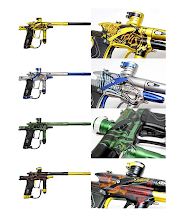 If you are coming out to play paintball at Red Dynasty and want any of the RED SEVENS to give you some coaching to make your paintball experience a bit more interesting - the RED SEVENS will be glad to come along be your coach for the day. Just drop us an email and we will be available at no charge. Thank you to Red Dynasty and Paintballers World for making this event happen. *In Singapore - the Police Rules says you have to be 14 years old to be able to play paintball. Maverick Yoon/ResidentEvilChef.com has taken some really good pictures of the Red Sevens especially of Gerald "The Kid" Lee. 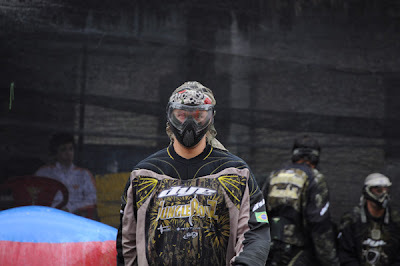 The pictures were taken at MPOC 2 2 weeks ago. The Division 2 Rankings for the MPOC after Leg 2 are up and the RED SEVENS have moved up 3 places from 5th in the first leg to 2nd after our win in the second leg. We won a total of 6 out of 7 matches in Leg 2 thus our leg 2 total was 6 points. Because there were less teams participating in the second leg, we had only 5 preliminary games of which we won 4. The other 2 points were collected from winning the semi final and the final matches. Eastsiderz stay on top by just a point with 13 points. They scored an impressive of 10 points from the first leg and add 3 points from the second leg to make it 13 points. We collected 6 points from the first leg and 6 from the second one to make it 12 points in total - a single point from the top spot. As a result of the MPOC Board Meeting on the 22nd April 2010 at 1.00 pm, the board has agreed with immediate effect, that the listed players below will be suspended for the 3rd leg of the MPOC 2010. During the meeting attended by Mr Paul Lam, YM Raja Khairul, Mr Patrick Tan, Mr. Nicholas Wong, Mr Junaidi Kalil and Mr Allan Phang, the board strongly advised players and teams to refrain from harassing and abusing the referees and tournament officials. 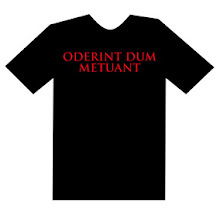 Future MPOC tournaments will impose severe suspension on players who are found guilty of unsportsmanlike conduct or who bring the game into disrepute during the tournament. The Jungleboyz is one of the most famous teams in South America. One of their players Xalo Almeida even made the Ironmen team a couple of years ago. 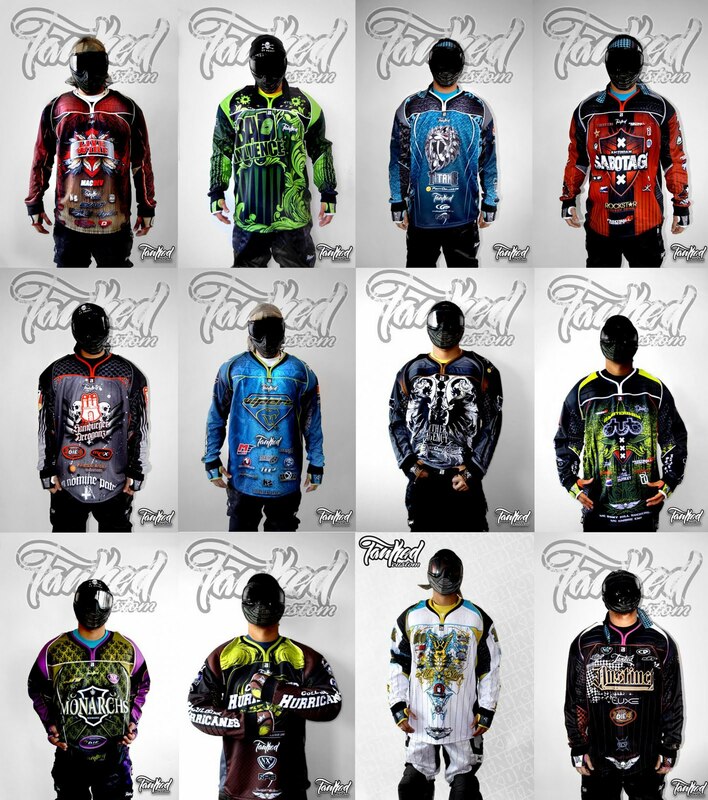 They are also a big Dye team in Brazil with their own Jungleboyz Edition NT and C10 jerseys. One of the nicest C10 jerseys I have seen so far. 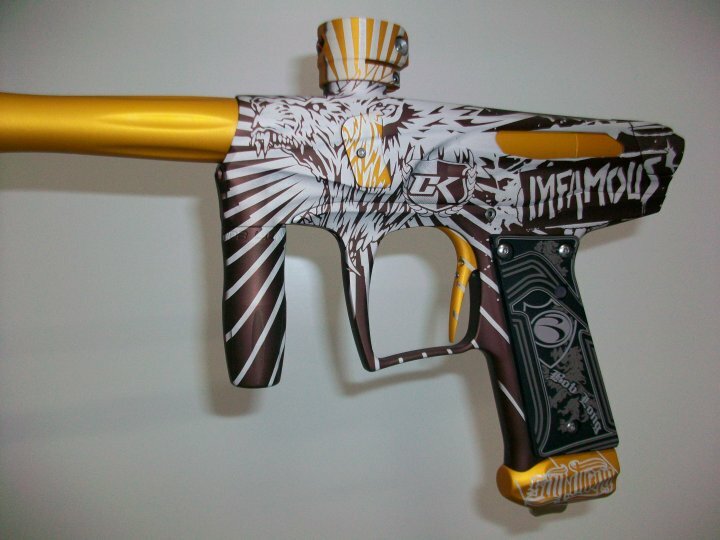 Yellow Camo mix. 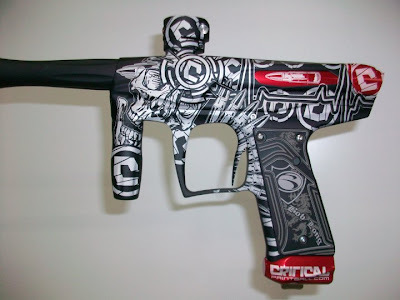 I have been trying to find out what happened over last weekend in Europe over at the Millennium Series opener in Malaga. As you would probably know that most of the teams couldn't get to Malaga in Spain as all flight across Europe were canceled due to the Volcanic ash form Greenland. London Nexus was stuck in Heathrow and Dean Apcar of London Shock told me that they went from Luton Airport to Standstead Airport because the former was closed. They were hoping to catch another flight from Standstead but after chartering 2 buses to get there- they were disappointed too have that flight canceled too. On top of that, those teams that were lucky to get to Malaga before the flight bans were hit with thunder storms like last year. So even if you did somehow manage to get to the event - the weather would still whack you. It was a double whammy and and I can say that Malaga is indeed a jinxed event for the Millennium Series. As things are still up in the air- the organisers are working of coming up with a solution because some games went on at Malaga and most were just canceled due to absent teams and bad weather. Below is the official email sent out to the teams. The Millennium Series will announce their solution to the unresolved situation at Malaga. 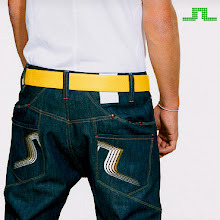 We have been looking at several options in order to be as fair as possible to everybody. We have worked on several schedule ideas and are having many in depth discussions in order to achieve the best possible result. By tomorrow afternoon we should be in a position to finalise and announce everything. At the same time we are also analysing all the extraordinary events that affected last weekend in order to learn and improve our systems wherever possible. 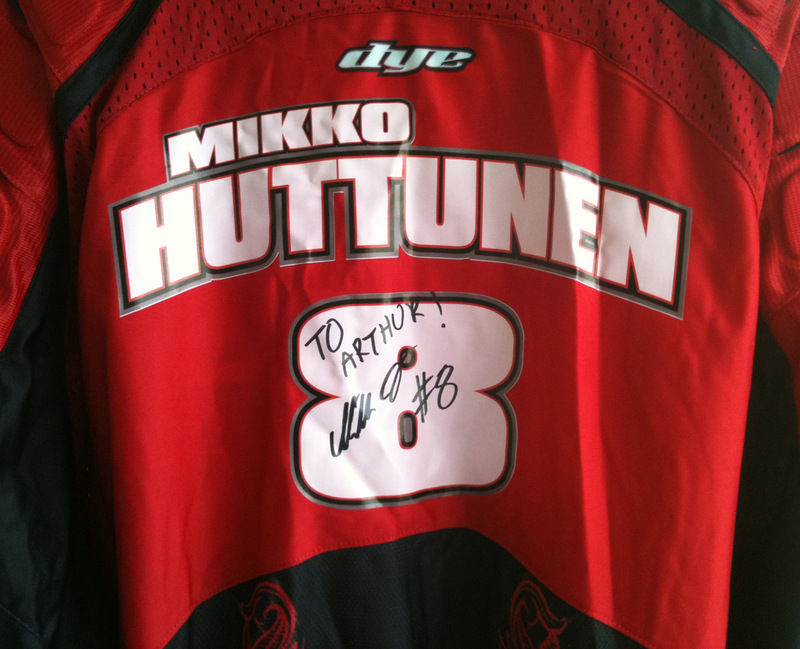 Mikko sent me his C9 Ironmen jersey last week and it finally came through after going to the wrong address. Jeff Stein sent me a preview of Episode 2 of New England Hurricane's highly successful and popular documentary on the rebuilding process of the team. The first episode was a huge success as it was watched by almost 25,000 viewers gathering a huge following across the paintball world. 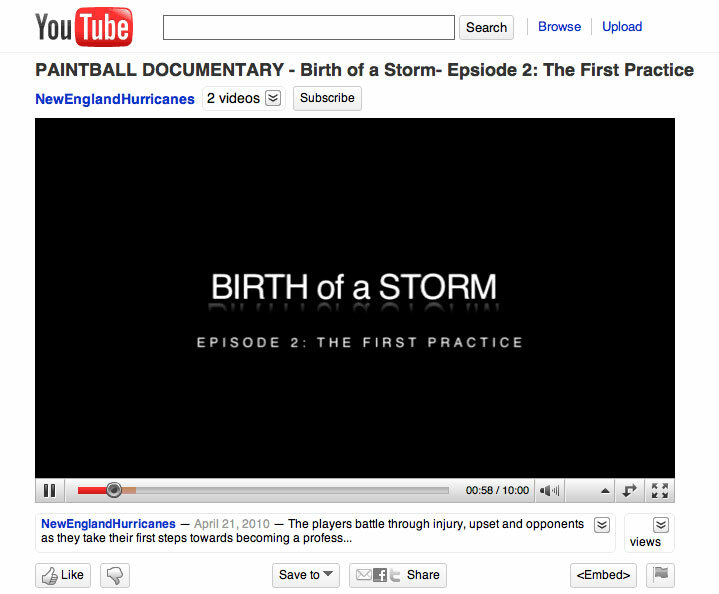 Thus Episode 2: The First Practice has been highly anticipated by Hurricanes and paintball fans across the world. In Episode 2 the new guys who were picked up in the selection process from the first episode went up against local teams from New England. We get to watch the process of getting together for practice and the teams grinding it out over 3 matches. In the first Match the Hurricanes’ new team took it to the locals but in the second match the locals stepped up and beat the over confidant Hurricanes who were getting cocky and sloppy because they won match 1 with relative ease. 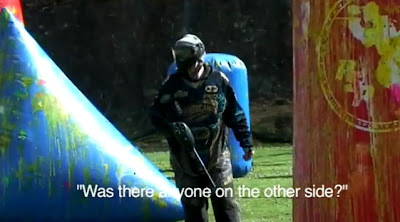 Watch what happens in the final round after the teams regrouped and Jeff Stein has a word with the team. 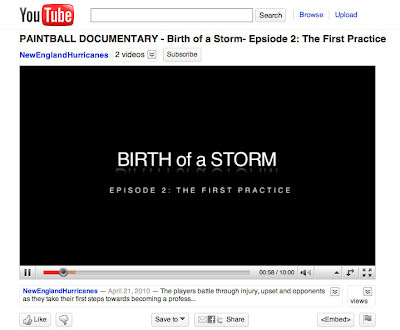 The 10 minute long Birth of a Storm Episode 2 is scheduled for official release on the 25th of April. 25 fans from the Hurricanes Facebook have been given the opportunity to watch it on 3 days ago on the 20th. Thank you Jeff Stein for the preview. 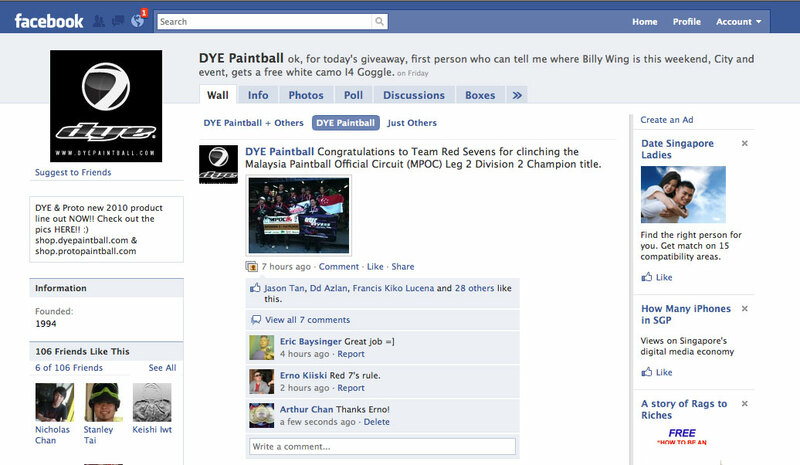 We are on Dye's Facebook again- thank yous to Erno in Finland and Deryk in Japan for the congratulations. 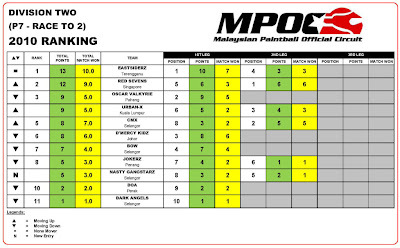 Having played MY-NPL in Melaka the week before- most of us rocked up to MPOC 2 in KL with sore bodies. 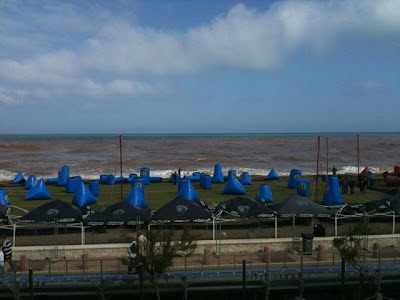 It was similar situation to playing PALS Pattaya right after playing in the SSC Cup in Kuching the week before. Melaka was a great warm up for us – better than a practice weekend. In fact the only practice we had going to Melaka was with Spyder Mech markers and I just drilled the team with NPPL style break outs where the markers had to come up form below our waistline. MPOC 2 was a nice quick weekend for us. We played 5 matches on Sat morning and were finished by lunch time. 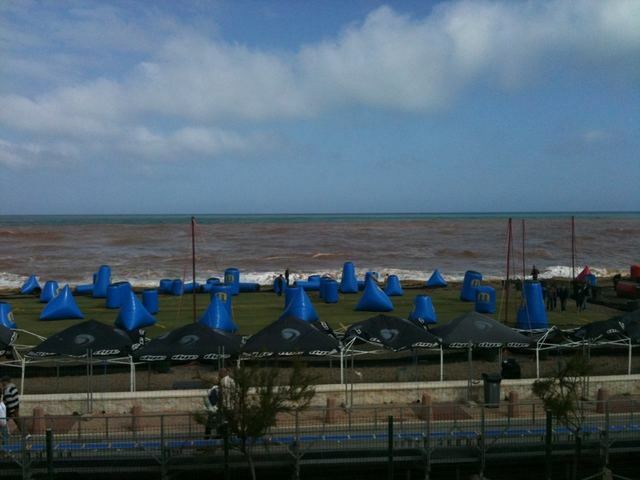 That gave the team the whole Sat afternoon off to relax and most of the guys went back to the hotel and slept. I stayed on and helped out with XFox. With the Sat afternoon off- that meant the final four teams were well rested for the Semi finals on Sunday. The 11am start was also greatly appreciated- it meant we could get up and have breakfast before going to the field. I must mention that I am very comfortable with the current Race to 2 and having to play all our preliminary matches on Saturday morning and the Semi Final and Final on Sunday. I hope this remains for the rest of the season. I certainly do not miss having to get up early both days and having to grind through 10 games over 2 days like back in our Division 3 days. The Saturday started very well for us- we played CMX first up who we have a lot of respect for. We went through a good run winning 2-0 in the first four matches and unfortunately we tripped up in out last game against first leg winners Eastsiderz. We wanted to finish with a perfect score but that was not to be. I think it might be a good omen to wake us up. That loss did not effect us much as we finished as the No1 ranked team at the end of Saturday. That meant we would be playing No4 ranked Urban X and No2 CMX would Play No3 Eastsiderz in the Semi Finals. As I mentioned earlier most of the guys went back to the hotel on saturday afternoon and had a nap while I stayed on to crew for XFox in Division 1. So everyone had a good rest and some came back to watch the late afternoon games. One of the things we’re good at is watching games and analyzing the plays and the zones to shoot. 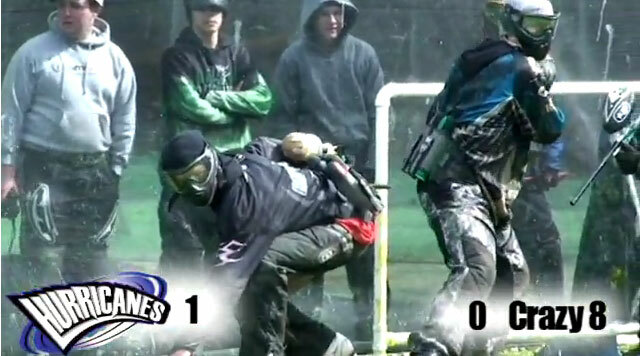 We picked up a lot of information watching the Division 1 teams play and this helped us on Sunday in the finals. Which is also one of the reasons I like to spot and crew for the Foxes. As a spotter I could see which bunkers are effective and which ones aren’t, where the zones are and how to move between bunkers. There really is no better information gathering than watching point after point – its like letting the Division 1 players walk the field for you in game situation. On Sunday we got up at a decently respectable time - had a leisurely breakfast and morning business. We rocked up early and casually settled into game mode. In the Semi Final we were confidant going up against Urban X as we had played them the day before. We won the first game pretty quick but because our forward guy was shot out he couldn’t sound the buzzer and we assumed that he did and walked off the field didn’t score the point. Head Ref Junaidi came over to tell us that the first game was deemed “null and void” – a big lesson to learn the hard way! So we had to go back out to get that first point again when it should be going out on match point to wrap the game. I went out annoyed and we pounded them into submission for our first point. To their credit they turned it around and beat us in the third game to square it at 1 point each. It was the first time we had to play a third and a fourth game all weekend but we managed to win it and get into the final. We had a long lay off before the finals. In the other semi final CMX expectedly beat Eastsiderz to get to meet us in the Final. We had lunch and a long wait till after 3pm to the Division 2 final. Again the long break was good for all of us. We were relaxed and just chilled out had a bit to eat and drink and waited. The Foxes beat Perth Trauma to get third and Redz came over to coach for us. I got XFox Simon to stand in a deep position just to eyeball the center back bunker as we knew that CMX will put 2-3 guys at home to lane us. We guessed correctly as they played the first point with 3 guys in center back. We managed to lane one of them and he got a 1-4-1 penalty. We got the first point pretty quick. The turn around was smooth- we had already pre planned the change over. The second point went on and this time they put 2 in center back – again the lane was effective and G1 was called. And again somebody on their side got a 1-4-1 penalty and Paul called G3 That gave us license to push up the Dorito side as the right side was down. Our right back moved all the way into the 50s and we shot the 4th guy out pretty fast and it was 5 guys hunting down their last guy in the left corner. 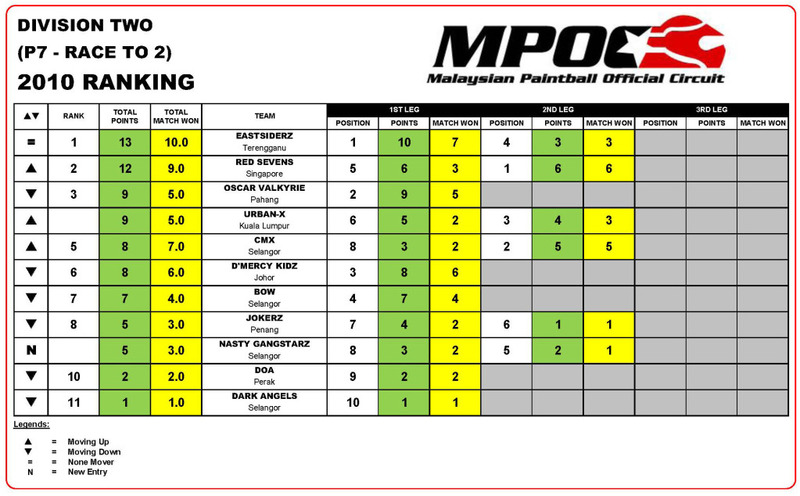 This is the Red Sevens first Win in MPOC after coming close with a 2nd place in Division 3 last year. This MPOC weekend was a better relaxed pace of us compared to playing NPL in the previous week. Again I think the games in NPL really helped us in MPOC. We would also like to thank and congratulate our brothers in Team XFox – hanging with them is always one of the highlights of the MPOC weekend. Thank yous to XK for walking the field with us and the coaching and Redza too for the coaching. Daniel and Sani for helping out and the positive encouragement and invaluable tips. Simon for the laughs too. The friendship, encouragement and experience from XFox are invaluable to us. Thank you to the Ultimate Marshall Junaidi and the Malaysian Marshalls for the all the hard work. Thank yous to Paul Lam of the MPOC for supporting the Red Sevens from the beginning and thank yous also to Allan Phang for your hard work. Thank yous also to the Black Aces for sponsoring a box of Paint. Good on you guys for coming out to play in Division 4. 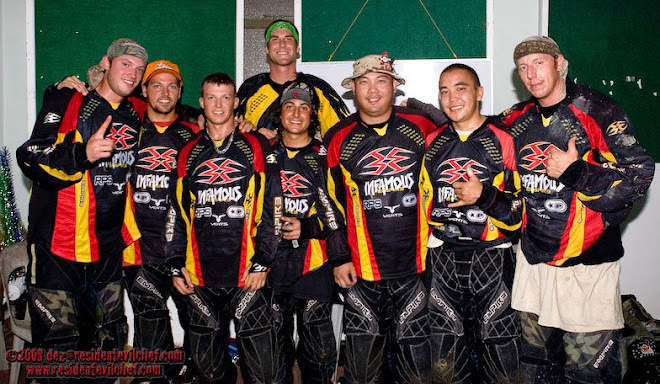 Thank you and commiserations to Patrick Tan to played on the CMX team who was a great sport. 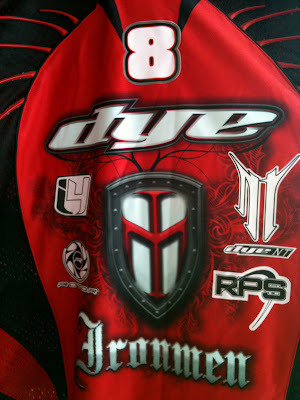 Rockstar - although last years jersey still rocks. 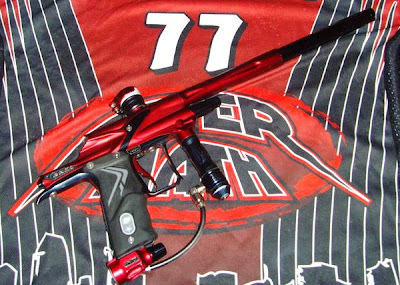 EDIT - that is also a Furious Barrel which Billy Bernacchia is shooting. 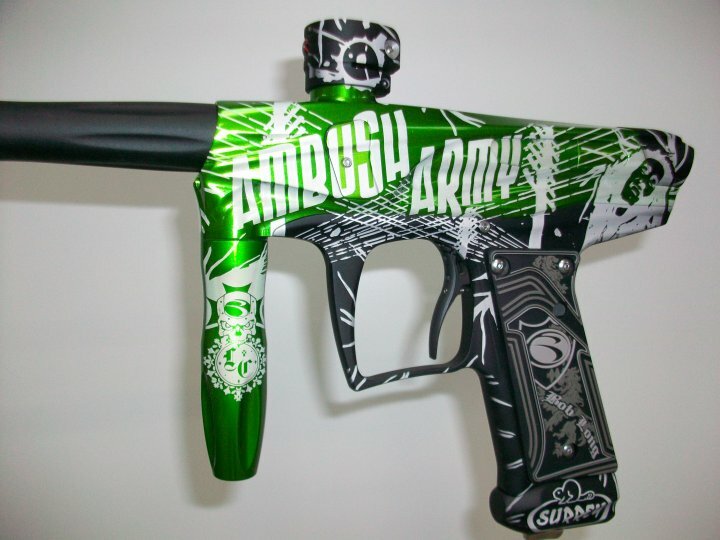 Billy plays on Vicious in the PSP who are a Furious team. Evidently he likes the barrel so much that he is using it on Avalanche. 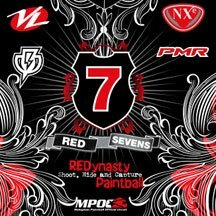 The RED SEVENS will be playing in MY-NPL Event 2 Melaka this weekend. Melaka is a historic town about 2 hours drive up from Singapore. It was an important trading port that was ruled by the Portugese, the Dutch and then the English. There are European styled buildings in Melaka. MY-NPL Event 2 will be held right in the city area amongst the malls and hotels and played on turf which is what we wanted to experience. 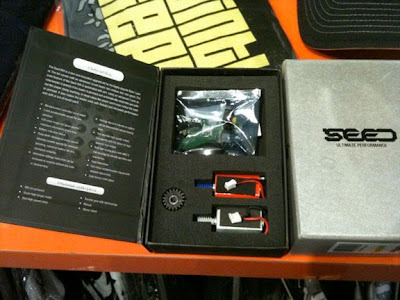 The RED SEVENS will have some SEED rotor upgrade kits with us in Melaka. Do come by to say hello our tent and check the SEED out. We will show you how it works and how it clears balls jams. We will also install it for you if you get one this weekend. The response to the SEED has been great - we sold out all our SEEDs in Kuching during the SSC Cup last month. Island Creamery is a 'home made' Ice Cream shop in Singapore where they made special local flavors like Tiger Beer, Teh Tarik (pulled tea) Chendol, Horlicks and coconut. Best of all the place is always crowded with hot chicks. This weekend will be a busy week for the Red Sevens. Some of us will be flying back from Japan in the midweek and the team will be traveling to the historical town of Melaka to play in Event 2 of the MY-NPL Series in Division 2. 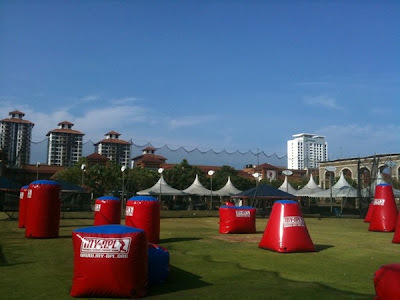 On the following weekend the Red Sevens will be back up in Malaysia- this time in the capital Kuala Lumpur for MPOC 2. This is not the first time the Red Sevens played back to back tournaments as we played in the SSC Cup in Kuching Sarawak on the weekend before jetting off to Pattaya Thailand for PALS Leg 1 last month. On the other side of the world our own Red Sevens team mate Zachary Hagy will be traveling to Lakeland Florida to play on the University of Missouri team in the NCPA National College Paintball Association tournament otherwise known as "the Nationals". The Mizzou Tigers will be playing in Class AA division. 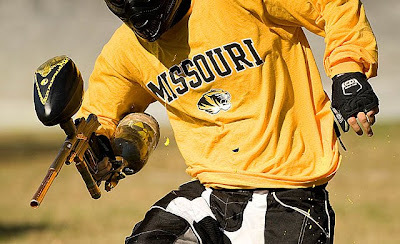 Our Mizzou Tigers paintball jerseys will arrive in Singapore this Thursday night - Thanks Zach! Here are a few really nice looking Victories from Bob Long's Facebook. – Bob Long's response on Facebook/Twitter to Dye's drive for 25,000 fans on their Facebook. This is the second part of the break out video, what Ollie and Mikko are teaching here is how to line up in the middle of the starting frame. 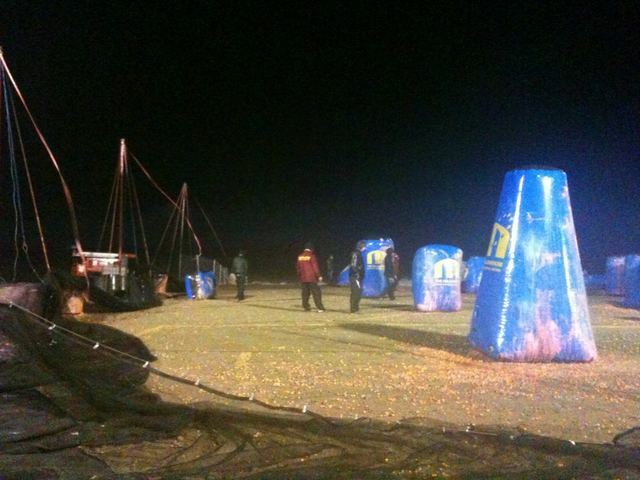 What they do is to line up back to back so when they swing their markers up- they won't get in each other's way. I see a lot of teams line up facing each other in the starting scrum and barrels will clash as they pull their markers up. If you line up facing each other in the middle then technically both of you will hold the marker in the wrong hand. Ollie and Mikko's technique is simpler and sharper and you come out shooting on the correct hand on either side. Ollie also shows you how to swing the marker up from the front is faster than coming all the way round the front of your body. How the Break out drill is set up is putting two chairs in the straight down the field on the 50 or 60 and each guy breaks out shooting the chairs in front of them while moving up. 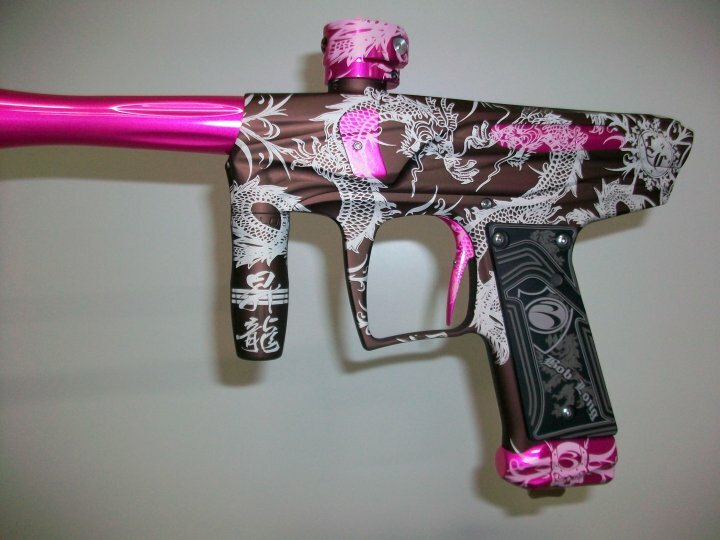 The idea is to shoot and maintain a lane from the break out. First you start off just shooting at the starting frame- then shoot and run 2-3 meters and then the next move 5 m and so in until you are running and shooting half the field. I would also add two guys running to the corners- shooting at the same chair. So on the break out 4 or 5 guys are shooting 2 "lanes" where the chairs are. The center guys move straight up - the guys on the side who play the doritos and snake will get used to shooting and running sideways. Guess which one is my favorite TNKD Jersey? Click on the image twice for full sized montage. I wonder who is Tanked's "The Stig" who poses in all these pictures. 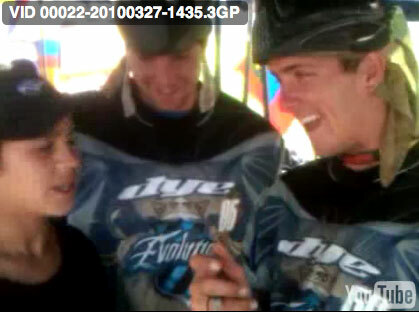 I spotted this very nice blue Team Evolution Dye C10 jersey in Brandon Short's video diary when we went to play in Colombia last weekend. Its has a very nice blue wave design with their team logo on the front. 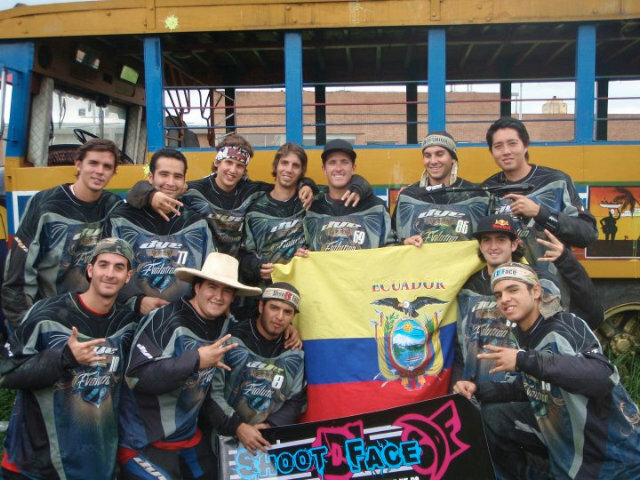 Team Evolution is from Guayaquil, Ecuador and they finished second over the weekend with Ironmen Brandon Short and Scott Kemp's help.